Before we get to the giveaway (or just scroll down a little further now if you simply can't wait! 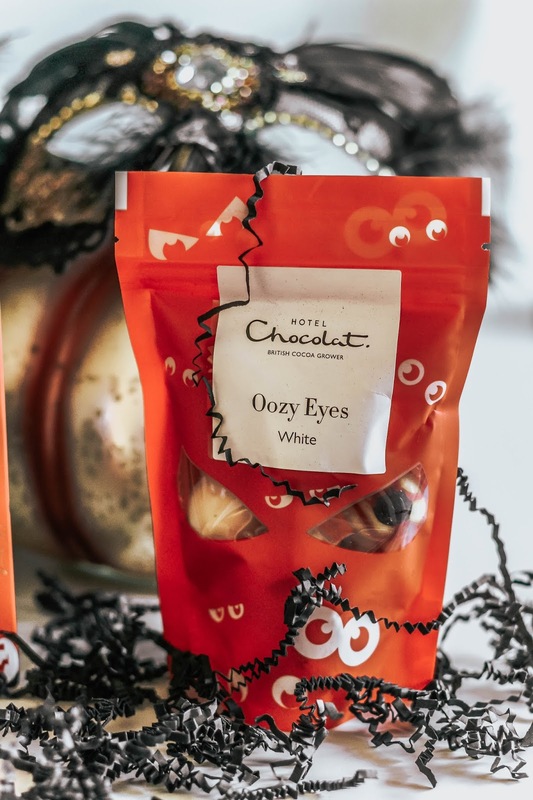 ), I just need a moment to swoon over this year's Hotel Chocolat Halloween selection. 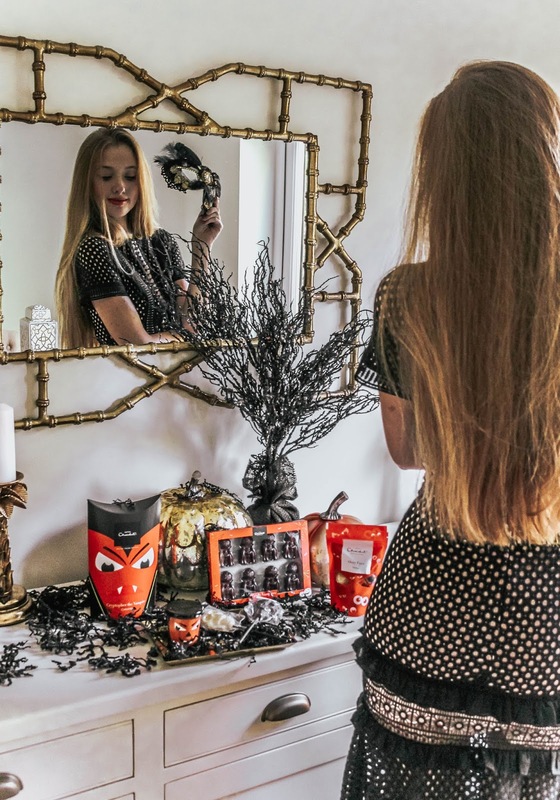 Along with The Little Monster Halloween Hamper, there's also a deluxe version called the Halloween Movie Night Hamper, which serves as the perfect selection box for a night in on the sofa, accompanied by scary films! 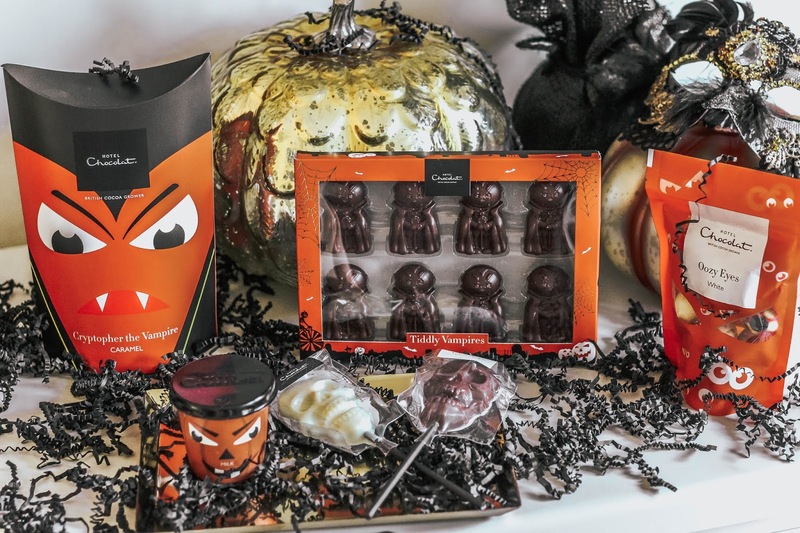 As well as hampers, this year's Halloween range includes Trick or Treat Buckets, chocolate lollies and plenty of truffles. Okay, enough temptation - it's time to cross your fingers and enter! The giveaway is open worldwide and anyone can enter. There are no mandatory entries, however the more entries you complete via the Rafflecopter below, statistically the better your chances will be of winning! Good luck to all of you who have chosen to enter this giveaway; in just over three weeks' time you could be tucking into this delicious Halloween hamper! The question is... would you share? I'd love to hear what you'll be up to this Halloween. Have you made any plans yet? Let me know in the comments below! Thanks to Hotel Chocolat for providing this prize! Love your dress gabrielle!!! So pretty! That's a great give away!!!!!! Love chocolate! Totally off topic, but I love your mask! Where did you get it from? Haha, thanks so much Anne. I'm afraid I picked it up from Homesense and so I'm not sure what brand it's from exactly! So cool babe, those chocolates look sooo good ! Hotel Chocolat are such a quality brand and so darn tasty. I think the hamper Idea is a FANG-tastic one lol (sorry). I adore your dress and love a masqueraid mask. I love that they also cater for vegans and love their dark chocolate and almond, with a nice cup of tea : ). You had me at chocolate. It all sounds so yum. U look stunning in this dress and I love all your pics. Theses chocolates look so good ! I Loe the Halloween theme packaging. And your photos are so beautiful like always. 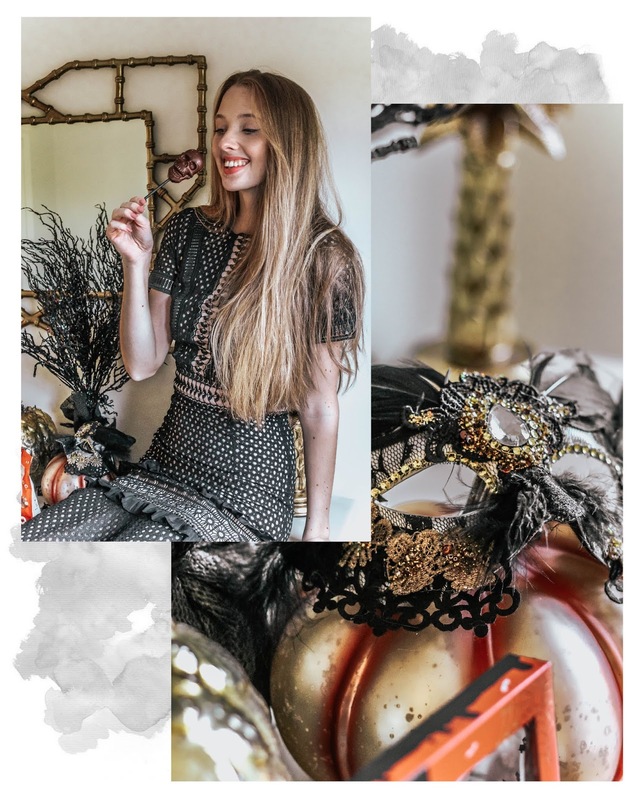 What a super cute giveaway- and perfect for this time of year! Such a lovely giveaway for Halloween. Everything is so classy in your pictures but I especially adored your beautiful dress Gabrielle. I love the color, fitting and design and the way you have styled it. So pretty dear. This is the cutest and most delicious giveaway ever! And of course, stunning photos! This is such a great giveaway! The chocolates sound amazing! I wouldn't mind trying molten caramel oozy eyes! :) Also your dress is absolutely gorgeous! Dear! Your pictures are always so cute!! What an awesome giveaway! Looking pretty as always Gabrielle! Ohh oozy eyes! Can't believe it, such creativity :) Love your dress and the mask! 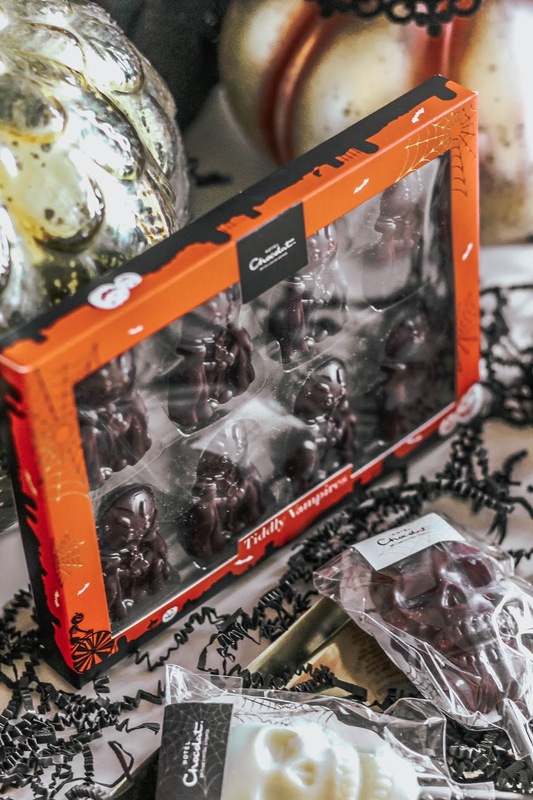 What an amazing giveaway - love Hotel Chocolat chocolates! Already looking forward to Halloween - can't believe it is so close! Have a great weekend, Gabrielle! Such beautiful photos! I am so excited about this giveaway. These treats look so great! Now this is a giveaway perfect for me! Chocolate is probably my favourite ever treat and Hotel Chocolat do such incredible quality chocolates that I'll definitely be entering this! Fingers crossed! Omg I literally just wrote a comment and then accidentally went back and lost it all. This is fully like the third time I've done that on blogs this month lol. 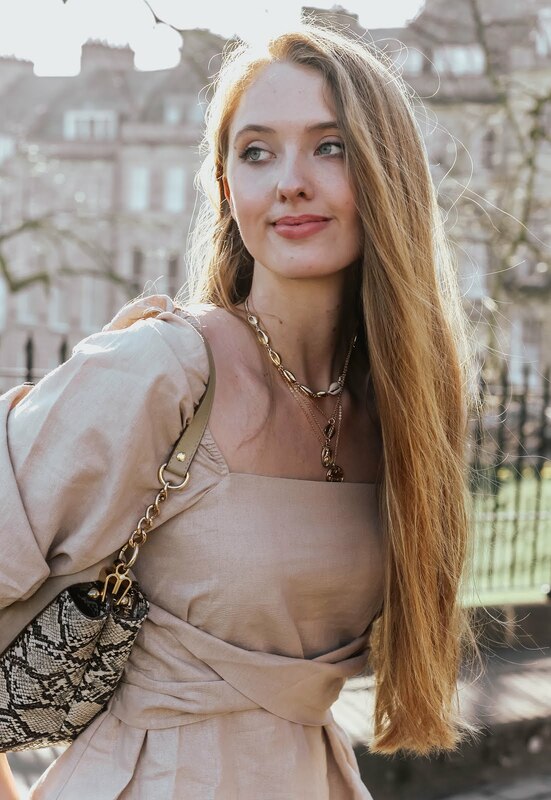 I basically just said that I'm right on the verge of leaving the house to go on a night out, but I wanted to leave you a comment first! 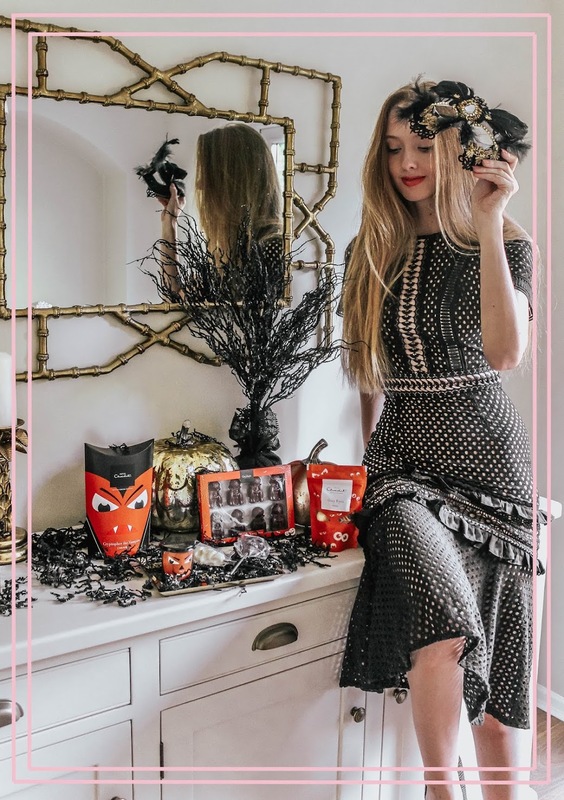 I always love when you post Hotel Chocolat pieces here with products up for grabs - even if it does make me hungry! I will 100% perfect be entering this giveaway in about two seconds before I leave - fingers crossed! What a beautiful dress! You look so lovely and chic. Fab photos as well. I don't really eat chocolate, but this is one yummy giveaway. You always have great giveaways. What a lovely giveaway! Thank you for the opportunity! Ooooh that's an amazing giveaway! I love Hotel Chocolat! Your photos are amazing as always! What a ghoulish giveaway - one lucky winner! Yum, what a fun collection from one of my favourite treat shops! 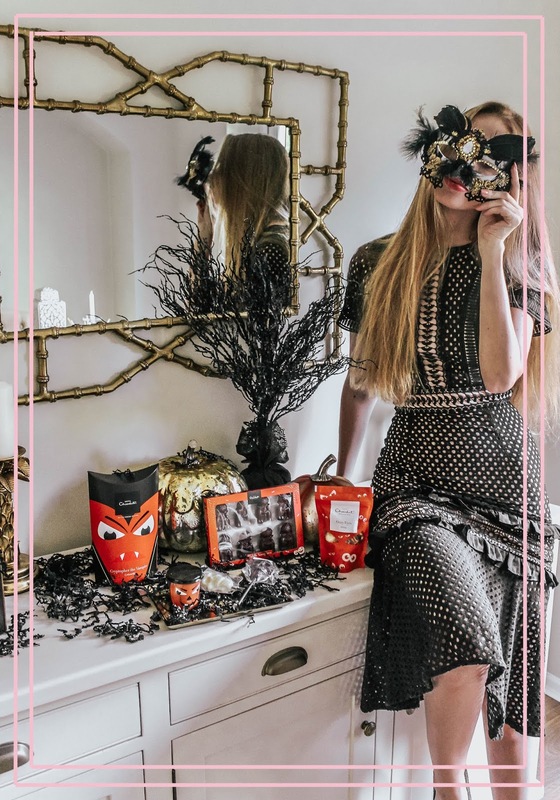 Beautiful Halloween pictures! Right now I have no plans for Halloween but I do love the costumes. Who knows what I'll do that day.